As part of my peanut butter haul a month or so ago which has included Mrs Freshleys Swiss Rolls & Budy Bar, Lindt Lindor Peanut Butter Truffles and Reese’s Crunchy Cups, I also picked up the Boyer Smoothie Peanut Butter Cups. 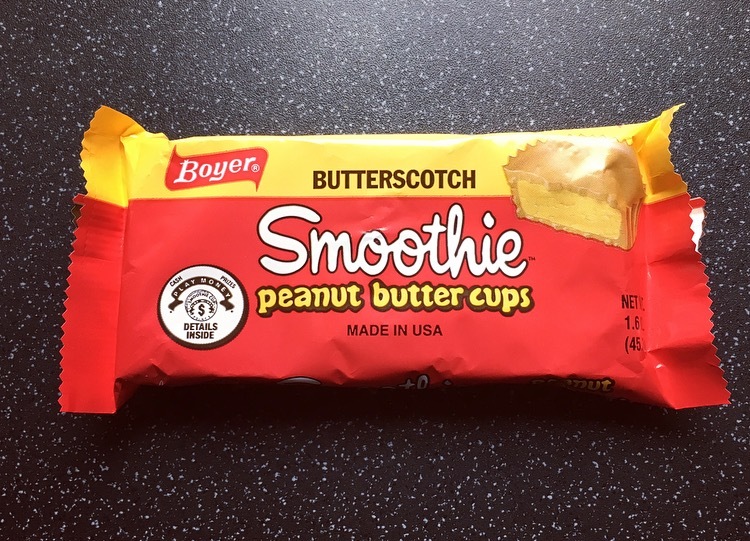 Now I have seen variations of the peanut butter cup, however have not come across the Boyer version, or a butterscotch coated cup for that matter. 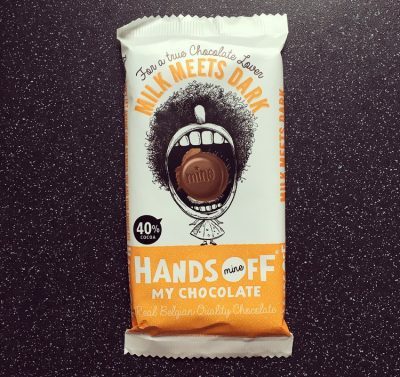 Boyer claim that these are unlike anything your taste buds have experienced before and you’ll want to come back for more. This is quite the statement, so lets see if this is the case. 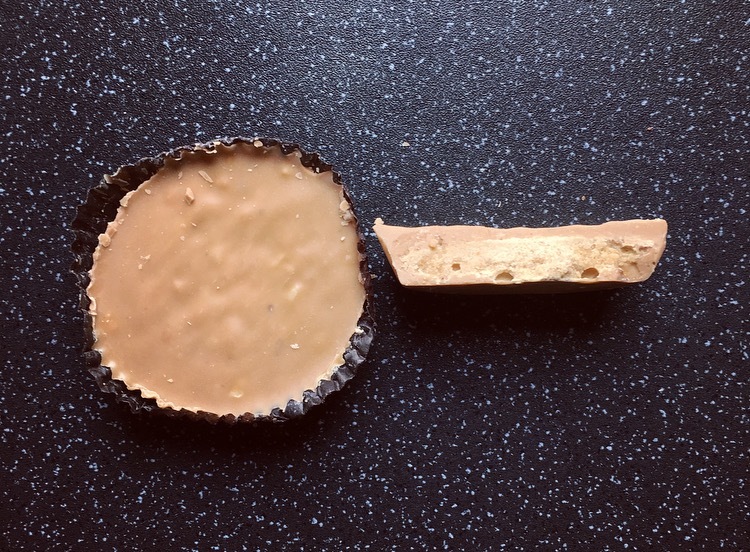 The presentation and finished quality wasn’t to the standards of the Reese’s Peanut Butter Cups. These are exceptionally pale and pasty and difficult to distinguish where butterscotch ends and peanut butter begins. There was a relatively thick layer of peanut butter which surprisingly only had the slightest peanut butter taste. It had an incredibly grainy texture and one that was not all that pleasant. Despite this it was actually the better of the two components. The butterscotch coating was horrendous. There is no painting it in a better light, it was truly horrendous. Uniquely delicious I beg to differ there. The butterscotch, if you can call it that, in no way resembles butterscotch. 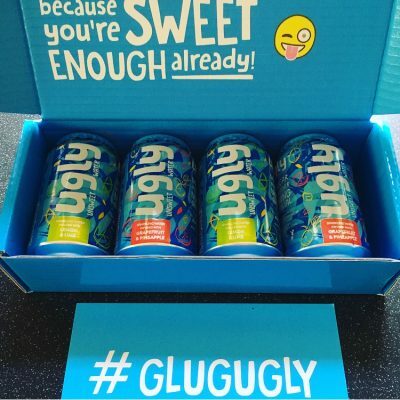 It is extremely sweet, artificial, overpowering in taste, and completely quashes the already dull peanut taste. Pairing that with the grainy innards is just a no go. Unfortunately Boyer Smoothie Peanut Butter Cups are unlike anything I have ever tasted and not in a good way. I’m all for taking a classic and giving it a twist but this does not work. Peanut Butter lovers this is one to avoid like the plague. I appreciated the rippled effect on the top of my Smoothie cups the seamless blend of butterscotch coating and peanut filling. The ‘grainy’ texture is due to pieces of peanut in the filling, which adds to the flavor. The butterscotch coating is smooth, mild, and melts in your mouth. These are a hidden gem.